This jolly scene is hand painted to make each adorable 4 winter penguins family personalized Christmas ornament one of a kind. It's crafted from premium resin using a hand carved design, and we add special meaning by hand lettering names, the year and a custom message. Each of these family ornaments arrives with our holiday display cord attached and snuggled in a posh and pretty velvet gift bag, a Russell Rhodes exclusive. 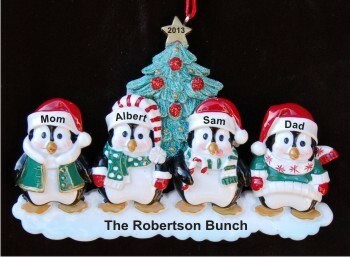 Celebrate a close-knit clan this season, yours or friends, with the 4 winter penguin family Christmas ornament personalized for lasting charm.